Party your way into fun with this unforgettable combo! Scuba dive, snorkel, swim and more! Grab a selfie at the best lookout point around - Hill Inlet Lookout! See the best of the Whitsundays and Fraser Island with our 5 Day Cool Dingo Fraser Island and Atlantic Clipper Whitsundays combo! See some of the top destinations in Australia including Lake McKenzie, Eli Creek, Maheno Shipwreck, Whitehaven Beach, Hill Inlet Lookout and the Great Barrier Reef Marine Park during your 5 days of fun. Cool Dingo offers an extensive tour of Fraser Island where you will get to visit all of its best destinations on the island! Your guided tour will allow you to relax on board your comfortable 4WD as your guide takes you around from one destination to the next. With everything included during your 3 day, 2 night tour, all you need to do is bring a sense of adventure to have the trip of a lifetime! This young, fun tour is ideal for those who want to have the best time possible while exploring the beautiful Fraser Island. Your guided tour will bring you to Fraser's best destinations to grab some amazing photos, explore the island and experience it at its best. 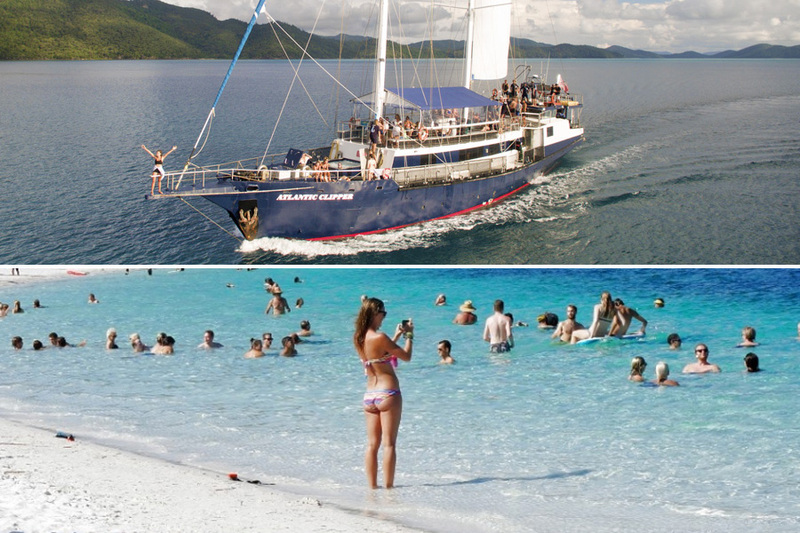 Atlantic Clipper is one of the funnest tours in the Whitsundays and certainly the biggest! This huge sailing boat is full of fun on the water, with an entertaining crew, packed itinerary, fun activities and lively passengers! Not only will this tour be one of the funnest few days of your life, but it will also get you to the top spots of the Whitsundays including Whitehaven Beach, Hill Inlet Lookout and the fringing reefs of the Whitsunday Islands for the ultimate island experience. There is snorkelling, scuba diving, paddleboards, a waterslide, spa and diving board ensuring you will have plenty to keep you entertained for 2 days and nights. Have the trip of a lifetime on the most fun boat in the Whitsundays! This tour is a party on the water and best for those who want to experience all the best parts of the Whitsundays with the extra perks! *A $40 per person Public Holiday Surcharge is applicable to tours on Atlantic Clipper where the vessel is at sea on Christmas Day or New Years Day.